Six Sigma Institute is the only Examination Centre for Certified Six Sigma Green Belt of the China Association for Quality in Hong Kong. 什麼是六式碼? What is Lean? What is the relationship between them? 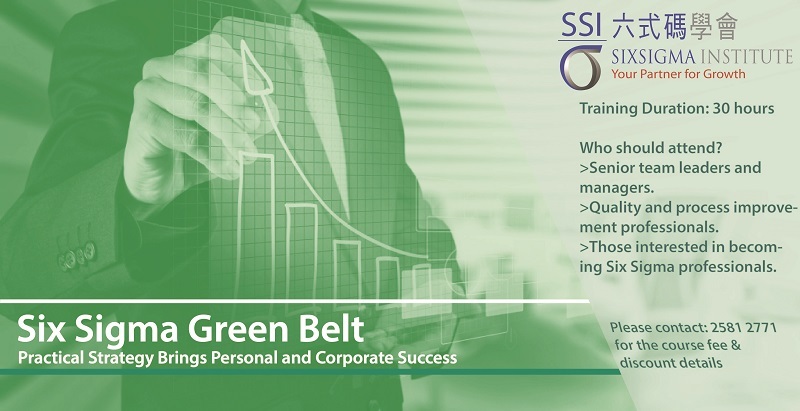 Six Sigma Green Belts are a vital part of a successful Six Sigma programme. Many organisations begin Six Sigma deployments by training capable employees to become Green Belts. They involve a larger critical mass of people to achieve breakthrough results from their Six Sigma initiatives. The aim of this course is to share our successful knowledge on how to apply the Six Sigma tools in achieving breakthrough improvements in customer satisfaction, cost reduction, process improvement and cycle time reduction. The Six Sigma Green Belt Certification Program contains of lectures and workshops. Senior team leaders and managers. Those interested in becoming Six Sigma professionals. Certificate of Green Belt in Six Sigma will be awarded to participants who have 70% or above attendance, complete all assignments, submit one individual project and pass the examination. Certification holders are eligible to be registered with SSI as a 註冊六式碼綠帶 and granted with the title of RSSGB. 請 聯絡我們 about course fee and DISCOUNT details.